Transcriptional and phylogenetic analysis of five complete ambystomatid salamander mitochondrial genomes. Title Transcriptional and phylogenetic analysis of five complete ambystomatid salamander mitochondrial genomes. 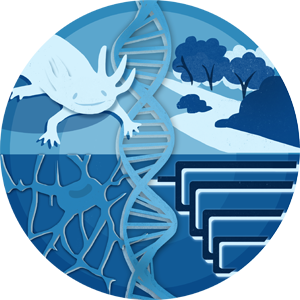 We report on a study that extended mitochondrial transcript information from a recent EST project to obtain complete mitochondrial genome sequence for 5 tiger salamander complex species (Ambystoma mexicanum, A. t. tigrinum, A. andersoni, A. californiense, and A. dumerilii). We describe, for the first time, aspects of mitochondrial transcription in a representative amphibian, and then use complete mitochondrial sequence data to examine salamander phylogeny at both deep and shallow levels of evolutionary divergence. The available mitochondrial ESTs for A. mexicanum (N=2481) and A. t. tigrinum (N=1205) provided 92% and 87% coverage of the mitochondrial genome, respectively. Complete mitochondrial sequences for all species were rapidly obtained by using long distance PCR and DNA sequencing. A number of genome structural characteristics (base pair length, base composition, gene number, gene boundaries, codon usage) were highly similar among all species and to other distantly related salamanders. Overall, mitochondrial transcription in Ambystoma approximated the pattern observed in other vertebrates. We inferred from the mapping of ESTs onto mtDNA that transcription occurs from both heavy and light strand promoters and continues around the entire length of the mtDNA, followed by post-transcriptional processing. However, the observation of many short transcripts corresponding to rRNA genes indicates that transcription may often terminate prematurely to bias transcription of rRNA genes; indeed an rRNA transcription termination signal sequence was observed immediately following the 16S rRNA gene. Phylogenetic analyses of salamander family relationships consistently grouped Ambystomatidae in a clade containing Cryptobranchidae and Hynobiidae, to the exclusion of Salamandridae. This robust result suggests a novel alternative hypothesis because previous studies have consistently identified Ambystomatidae and Salamandridae as closely related taxa. Phylogenetic analyses of tiger salamander complex species also produced robustly supported trees. The D-loop, used in previous molecular phylogenetic studies of the complex, was found to contain a relatively low level of variation and we identified mitochondrial regions with higher rates of molecular evolution that are more useful in resolving relationships among species. Our results show the benefit of using complete genome mitochondrial information in studies of recently and rapidly diverged taxa.